for a break on the Riederberg (Karwendel) in the ski hut with the same name. In winter when stop for a break is always very nice, my special hut with homemade specialties, a wonderful view of the surroundings and great atmosphere is waiting for you. Will spoil you with delicious cakes, pies which you can taste on-site, or you can order them for different occasions as weddings, baptism or birthdays. I make different types of ice cream from regional organic hay milk. By production of ice cream we use fresh fruit only and leave out any kind of food colouring and preservatives. NEW: Ice cream is offered in winter too! 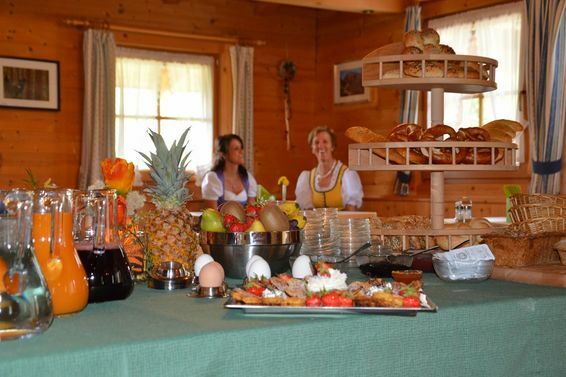 "When the sun smiles, ice cream will be made"
We offer breakfast for skiers and hikers!